Writers, this is for you!! Celebrate Mooroolbark is running a Writing Competition for students, sponsored by Victoria’s Deputy Premier and Minister for Education, James Merlino MP! Winners will be awarded cash prizes by Mr Merlino himself, on the main stage of the festival between 11:40am and 12 noon. What concerns you most about the environment – locally/nationally/globally? Why/How is it easy to “be green”? Why is “being green” important now and in the future? Imagine a world/city/town where everyone lived sustainably, what would it look like? Can you imagine the future and how people’s lives might be different to ours if environmental sustainability is/is not adopted by people today? Entry is a Gold Coin and entries should be submitted to the Mooroolbark Community Centre no later than Friday, March 17. Head over to our Writing Competition page for more details on how to enter. The fantastic drawings that accompany Levi’s stories are by Cameron B from Warranwood Primary School. More stories from the festival will be uploaded in the coming days. 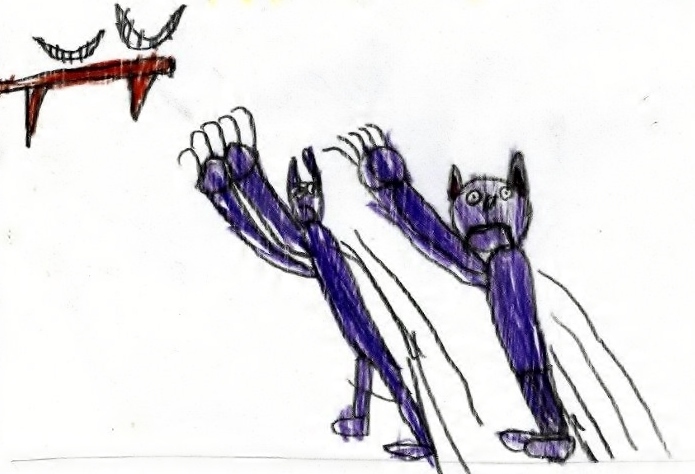 Detail of drawing by Cameron B, Warranwood Primary School.